, AdWords product managers and I will be hosting a half-hour livestream to look back at this year's new features, offer best practices, and share customer success stories. Understand how app developers are driving installs and re-engagement across search, display, and YouTube on all those shiny new devices people will unwrap this holiday season. Learn how LendingTree and Blinds.com are making more informed business decisions by measuring cross-device conversions and phone calls. Discover essential best practices for automated bidding and app promotion. Wrap up the year with an announcement you won’t want to miss. We think you’ll like it. We hope you’ll join us December 10th, here on the Inside AdWords blog as we click through AdWords in 2014. Whether you’re building out new campaigns or making critical budget decisions, we want to help you start off the new year with everything you need to connect with your customers, wherever they may be online: across the web, on mobile-sites, and in apps. On December 10, 2014 at 12:30pm PT / 3:30pm ET, AdWords product managers and I will be hosting a half-hour livestream to look back at this year's new features, offer best practices, and share customer success stories. And we’re currently sending more mobile traffic to retailers per week from Google Shopping than we did during the peak of last holiday season.2 So we're making it easier to find the information and images people need to make shopping better on mobile. Great product data is at the core of what drives successful Product Listing Ads (PLAs). As you’re preparing your Shopping campaigns for the upcoming holiday season, it’s important to ensure that your data is free of issues so your products are shown to shoppers. To help identify issues with your product data, we're excited to introduce the Diagnostics tab in Google Merchant Center. The Diagnostics tab provides consolidated issue reporting for your Merchant Center account, feeds, and items. Through this tab, which replaces the Data Quality tab, you gain better insight into the health of your product data, making it easier and faster to prioritize key issues and get your products online. Try out the new Diagnostics tab today in your Merchant Center account. To learn more about changes to the tab, visit our Help Center. last year so you can start answering those burning questions, and today, we’re excited to announce a handful of additions that’ll help you find new ways to optimize your Shopping campaigns and engage shoppers on all devices. Auction insights report lets you compare your Product Listing Ad (PLA) performance to other advertisers participating in the same auctions as you are. With impression share, overlap rate and outranking share, you’re able to see trends amongst your peers and strategic opportunities to improve your bidding strategies. Search impression share has been revamped to be more useful and aligned with text ads. You can now analyze your share of voice at the granularity you want with Search impression share in the Dimensions tab. You’ll know which campaigns are limited by a low budget with Lost IS (budget) and which ones need further optimization with Lost IS (rank). Note that we now calculate Search impression share at account level so you may notice a change in impression share between October and November. Device and time segmentation are available to help you refine your bid modifier strategy. You can see if your peers received more mobile impressions than you over the weekend with the Auction insights report segmented by device and day. Bid simulator columns show you what your advertising results could’ve been had you set different bids. You can add these columns in your Product groups tab and, for example, find product groups that’ll drive the most incremental clicks. Flattened view of your product groups presents another way to analyze your performance. It allows you to sort your product groups within an ad group based on performance data and easily identify which to optimize. For example, you can sort by impression share, find a few product groups with the lowest impression share, and fine-tune those bids within a matter of clicks. We hope these additions will help you identify easy-wins for the holidays and unlock new, more actionable ways to optimize your Shopping campaigns. We’ll continue to explore other reporting needs so you have relevant and useful data at your fingertips. Visit our help center articles for more information on Auction insights, Search impression share, bid simulator columns, and the flattened product groups view. Want to get more impressions and clicks for your Shopping campaigns? Or want to know how to spot missed opportunities in your bidding strategy and find your mobile share of voice? We introduced competitive landscape data last year so you can start answering those burning questions, and today, we’re excited to announce a handful of additions that’ll help you find new ways to optimize your Shopping campaigns and engage shoppers on all devices. 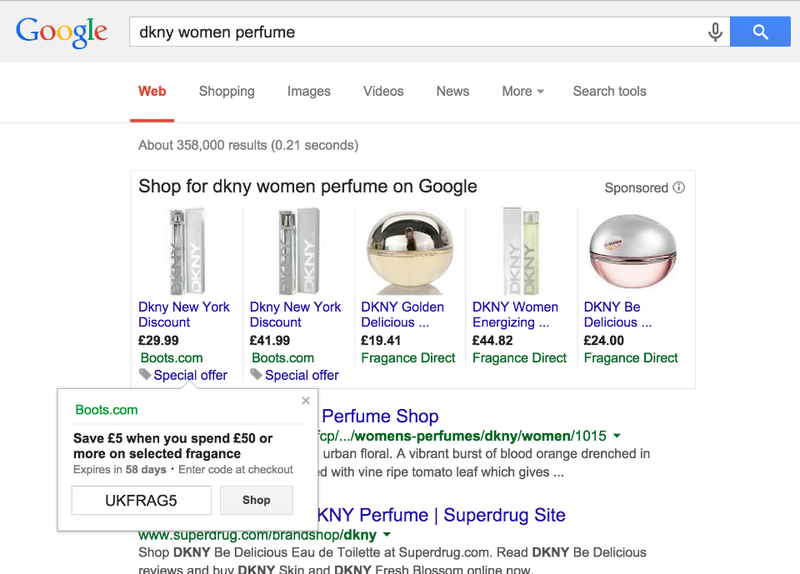 to retailers in the US, enabling them to show promotions alongside Product Listing Ads on Google search results and Google Shopping. Based on positive feedback, we’re excited to make Merchant Promotions available to retailers in the United Kingdom, Germany, France, Australia and India. Participating US retailers have seen improved performance from their Product Listing Ads. For example, Venus’s PLAs with Merchant Promotions had a seven percent higher clickthrough rate (CTR), a two percent higher conversion rate, and an 11 percent lower cost-per-click (CPC) than their standard PLAs. Read more about Venus’ success with Merchant Promotions here. If you’re interested in learning more about Merchant Promotions or planning on running promotions this holiday season, please review this Getting Started Guide and fill out the interest form to get in touch with our team. 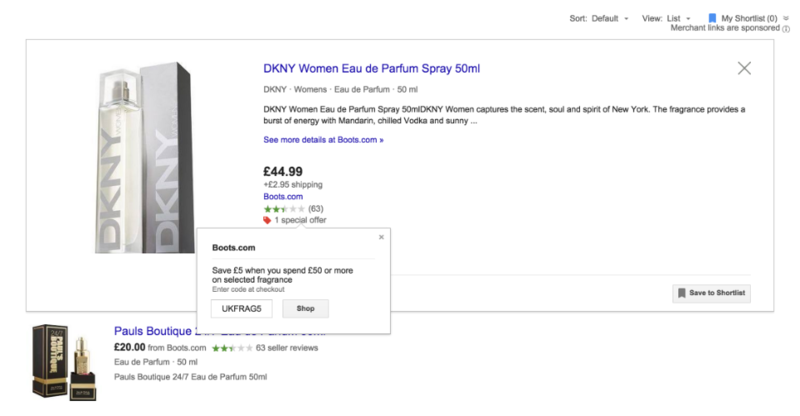 Two years ago, we launched Merchant Promotions to retailers in the US, enabling them to show promotions alongside Product Listing Ads on Google search results and Google Shopping. Based on positive feedback, we’re excited to make Merchant Promotions available to retailers in the United Kingdom, Germany, France, Australia and India. The Internet gives us more to look at every day: more information, more reviews, more offers. In fact, 49% of customers now visit 2 to 4 sites before they decide to buy1. One powerful lever to re-engage these qualified customers and close the sale is RLSA. What’s the most efficient and effective way to tag your site? Which types of remarketing lists should you focus on? By how much should you raise your RLSA bid adjustment? What advanced strategies can you use to expand volume? Download Winning the Second Chance to win your customers over in the moments that matter and to make the most of your RLSA campaigns. 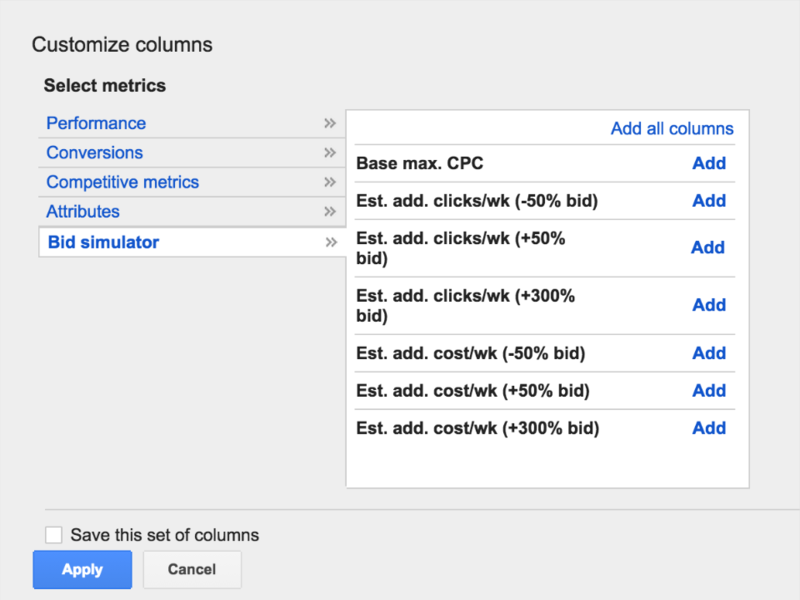 Automating your bids with AdWords can deliver better, more informed bids while saving you time. In order to help people make the most of these strategies, we’ve put together A Bid for Every Auction, our new guide to Google’s automated bidding solutions. This best practices guide is for anyone looking to implement or improve their automated bidding. If you’re considering taking the plunge with automated bidding, or if you already have and want to improve performance, download our guide or the one-page version of our automated bidding checklist today. Smart automation can lead to better results and more time saved. Check out these and other Google Best Practices over at g.co/GoogleBP. , a tool for optimizing your ad text and connecting with your customers in real-time. This kicked off a series of Tools for the Power User built to help you simplify campaign management, and act on key business insights at scale. As the holiday season approaches, advertisers are busy ensuring their campaigns are set up for success, making it more important than ever to manage time-sensitive updates and make changes to your campaigns quickly and efficiently. This month, we’re turning our focus to scalable and efficient workflow management in AdWords. Our goal is to help you find time-saving ways to manage these tasks at scale using simpler, integrated workflows within AdWords, so you can focus on your core business. Advertisers need to manage multiple campaign tasks directly in the AdWords interface more efficiently. We’ve added new tools for editing your settings and extensions in bulk across your campaigns and ad groups. For example, you can edit location targeting or ad rotation settings across multiple campaigns, or update your ad extensions -- like sitelinks, callouts, and apps -- to promote your latest holidays deals across hundreds of your ad groups with just a few clicks. CarsDirect.com was able to add sitelinks across its accounts using the new bulk editing features, and saw a 13% increase in CTR, and 6% decrease in CPC. Allison Query from CarsDirect says, “The bulk feature for ad extensions has been crucial for keeping us competitive in the search results! It has trimmed our work time from hours to minutes." 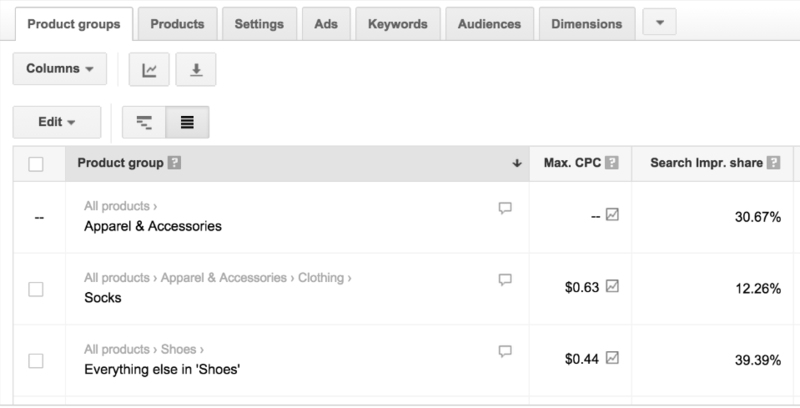 You can also take advantage of other existing bulk workflows supported in AdWords to scale your work. Save time by using the copy and paste feature to swiftly copy over your existing keyword lists, ads, and ad groups into your new campaigns. Advertisers need easier ways to make quick changes offline in spreadsheets, and apply them directly into AdWords where and when they need them. The improvements to bulk uploads include more intuitive spreadsheet formats, in-context options to upload changes directly into the appropriate campaigns and ad groups, and the ability to preview your updates and check for errors before posting them. Now, you can quickly upload new seasonal keywords into your ad groups, update your budgets across several campaigns, and post your changes with confidence because you can review them before you post them. Many agencies are using AdWords Scripts for MCC to power customized ad text changes across their customers’ accounts, save time, increase relevancy, and improve their ad performance. iProspect uses Adwords Scripts to dynamically insert sitelinks into Cleartrip’s ad units and change their landing pages on the fly, resulting in a 34% increase in CTR and 24% decrease on Cost-of-Acquisition. Performics is using AdWords Scripts for MCC to update ad parameters with real-time discounts across their customer's accounts. Using MCC scripts for MonShowroom, Performics cut their workflow time by 60%. 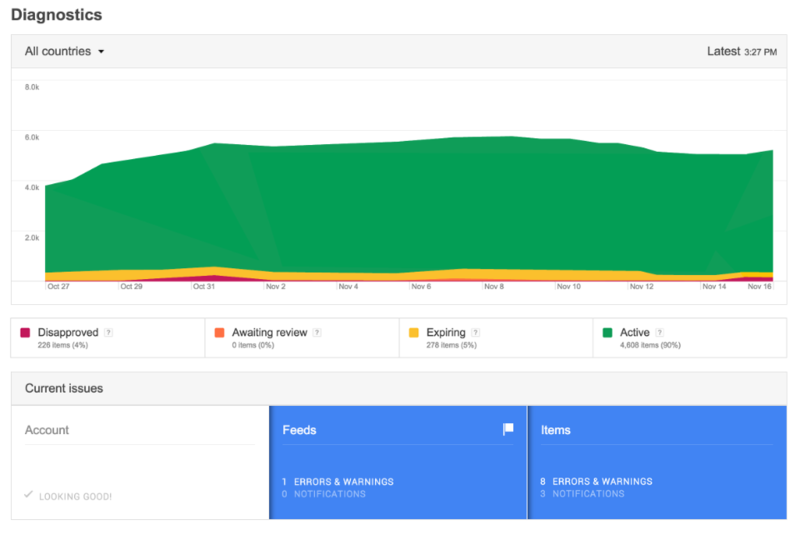 These are just some of the tools we’ve created to help you move faster, and make changes at scale across AdWords. 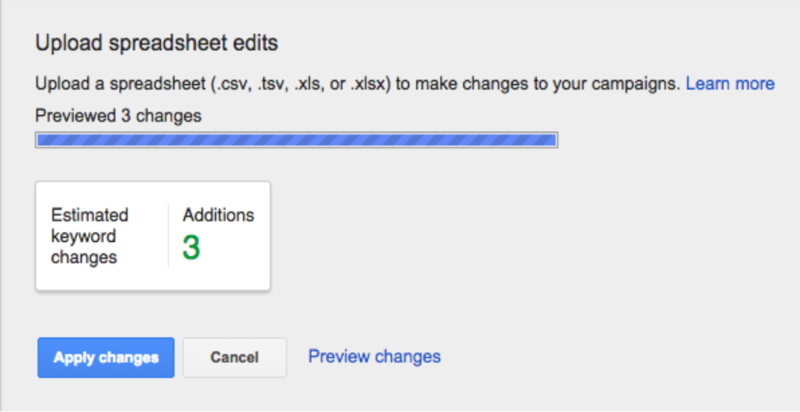 Stay tuned as we continue to improve AdWords Editor -- another important tool to help with complex changes at scale. New updates are coming soon! Check out our Hangout on Air on Tuesday, November 4th at 9:30 am PST / 12:30 PM EST to learn how you can put these tools to work in your campaigns. A few months ago, we announced ad customizers, a tool for optimizing your ad text and connecting with your customers in real-time. This kicked off a series of Tools for the Power User built to help you simplify campaign management, and act on key business insights at scale. The trend of profit-driven marketing continues to gain traction. Marketers are starting to shift the perception that they should really be viewed as profit drivers instead of cost centers. We hope that these guides have started some very interesting discussions across your organization, most notably around how important marketing’s role is for growth. To help advertisers bring these conversations to life, we’re excited to share our latest best practices guide called Making a Bid for Profit - Profit-Driven Bidding Tactics with AdWords. Save time by scaling your bidding strategy so it’s easier to manage. Consider this a treasure map for finding untapped profits in your account. Access the guide today. Happy hunting! You can check out more Google Best Practices at g.co/GoogleBP.